George Lucas' Mega-Mansion | Exclusive New Photos! 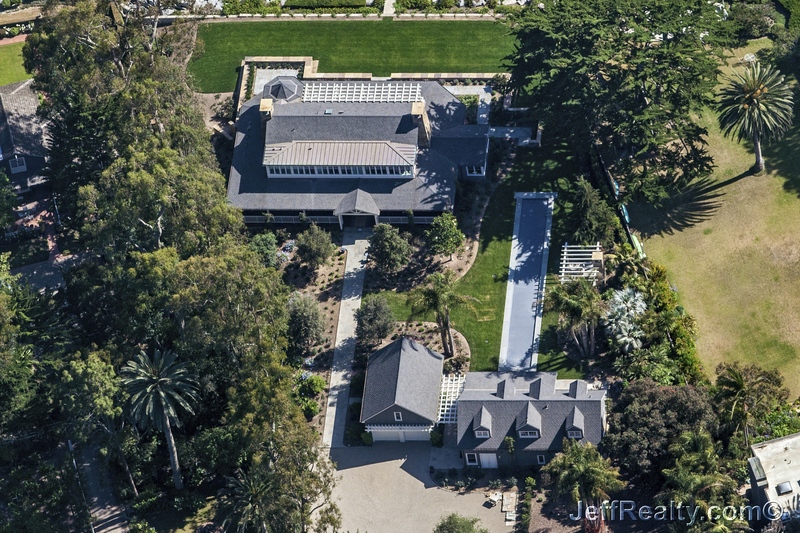 George Lucas’ Mega-Mansion | Exclusive New Photos! Star Wars creator and legendary director George Lucas has his multitude of fans, and the über-anticipated arrival next month of the new Disney-created installment of the Star Wars franchise drives those fans to a nearly drooling state. But back here on planet Earth, Lucas’ very real real-estate dramas have given him detractors, in a real court of law, if not one of social opinion. And just this week, the Chicago Tribune reported more legal troubles Lucas and other big-name contributors are having over a proposed arts museum on a lot that shares space with a parking garage and parking lot in downtown Chicago. A local group calling itself “Friends of the Park” claims Lucas and others will profit from the development, and even though it potentially would bring big money to the blighted area, it may violate the public trust by deeding land once held for the common good. 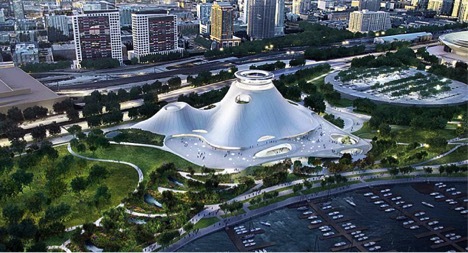 The Tribune reports, “Lucas plans to display his art and film collection at the 300,000-square-foot museum, which also will contain several theaters, a library, and a public observation deck.” An attorney for the city says the legal squabble centers on whether the museum project is a transfer of public property by leasing it to Lucas and his fellow investors – and whether it benefits the public. But like Bobba Fett, the notorious bounty hunter on Hans Solo’s trail, controversy seems to follow Lucas, even to his waterfront home. Lucas shocked everyone from real estate agents to neighbors when he tore down what architects called a “modernist masterpiece” to build his current home in Carpinteria, California, on the beach. The previous home at 3389 Padaro Lane was designed by sculptor and architect Sherrill Broudy. The new home, designed by architect Appleton & Associates, has 6 bedrooms, 4 bathrooms, and a carport. The thing that strikes us about it is the size compared to that poor cottage to the right. Heck – looks like Lucas’ own “cottage” on his property is larger than that one next door. Must be an indie-film maker! 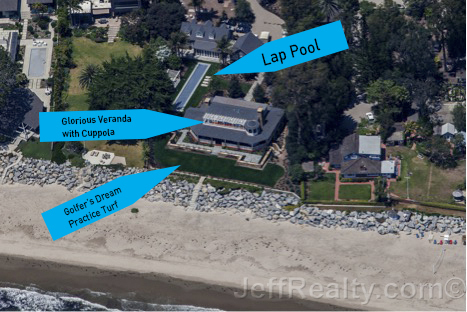 Lucas’ masterpiece by the sea has some interesting features that really capture the SoCal lifestyle, including a lap pool that dwarfs the size of his neighbor’s house. Take a look at that lap pool! We’re guessing 60 feet long. With your eye, tip it sideways so it lines up with the house – it’s at least as wide as the main part of the house…and is bigger than Lucas’ neighbor’s entire house. And given the area’s arid climate and the unnaturally deep green color of Lucas’ “grass”, we’re guessing that’s artificial turf. Makes sense – saves water. And if he ever wanted to do a “golf” movie he could practice with some nice views facing the water. If you notice, the entire home is designed to take in that gorgeous view – with a wraparound veranda and a second-story veranda with a beautiful cupola (no reference to his other director friend, Francis). 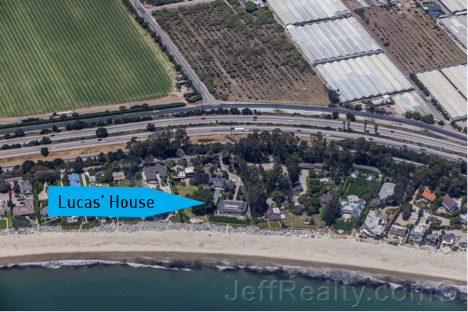 Lucas bought the original home at 3389 Padaro Lane in Carpinteria for $19.5 million and then tore it down to build what he wanted, including a lap pool. Hey — are those sharks in the water? 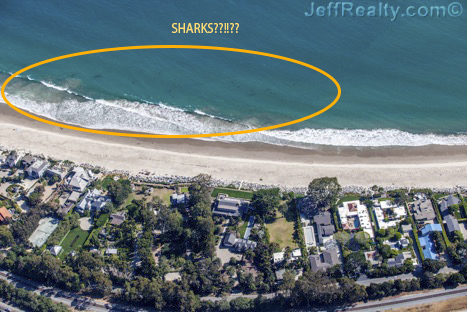 We’ll excuse that lack of yard space the film maker has here, since there’s more than adequate space at the aforementioned Skywalker Ranch, and even millionaires get squeezed for space when the property is this valuable (and gotta say, LOVE that view, sharks or not). It’s interesting to notice who (or what) Lucas’ neighbors are across the highway…not alien life forms, not “more millionaires”, but produce! So while Lucas and Spielberg and the sunny climes they inhabit might make us think of born-again dinosaurs, bicycle-riding aliens looking for an Über, or giant sharks with a taste for revenge, realize that compared to the vast industry of farming in California, Lucas is just a little fish. One project Lucas won’t be involved in is the new SW installment, “Star Wars: The Force Awakens”. Even though Walt Disney purchased his ideas with Lucasfilms in 2012, critics say Disney was not impressed with the storyline taken by Lucas and his suggestions and decided to go an entirely different route with the story. One thing is certain – it won’t receive as much controversy as Lucas’ real estate projects, which could be titled, “The Developer Awakens”. Posted in Celeb Homes on November 19, 2015 at 3:32 pm.